The Sinclair ZX Spectrum was one of the most popular home computers in British history, selling over five million units in its 1980s heyday. Amongst the thousands of games released for the Spectrum during its lifetime, the text adventure game was to emerge as one of the most significant genres on the system. The Spectrum of Adventure chronicles the evolution of the text adventure on the ZX Spectrum, exploring the work of landmark software houses such as Melbourne House Software, Level 9 Computing, Delta 4 Software, the CRL Group, Magnetic Scrolls, and many others besides. Covering one hundred individual games in all, this book celebrates the Spectrum’s thriving interactive fiction scene of the eighties, chronicling the achievements of major publishers as well as independent developers from the machine’s launch in 1982 until the end of the decade in 1989. The Sinclair ZX Spectrum is a Registered Trademark, Copyright ©1982 Sinclair Research Ltd., all rights reserved. This book is an unofficial publication and has neither been endorsed nor approved by Sinclair Research Ltd. 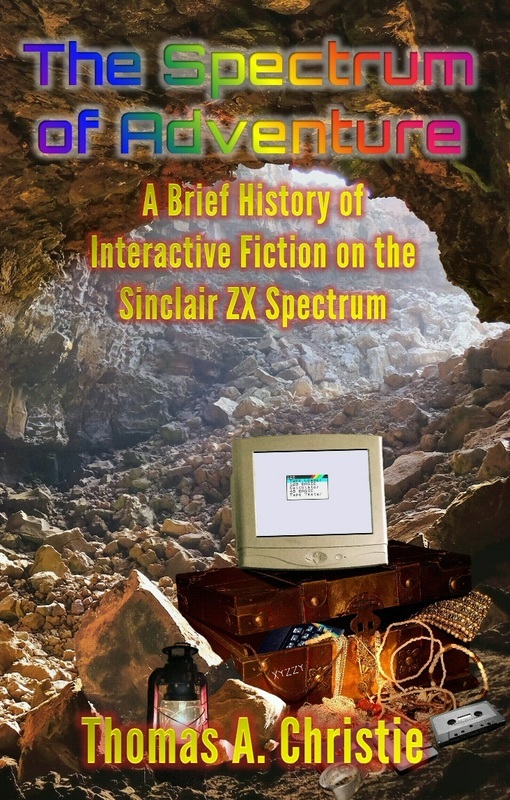 This book discusses one hundred interactive fiction titles that were commercially released for the Sinclair ZX Spectrum during the 1980s, including: Adventure 1 (1982), The Hobbit (1982), The Island (1983), Colossal Adventure (1983), Snowball (1983), Mountains of Ket (1983), Adventure Quest (1983), Ghost Town (1983), Lords of Time (1983), Rescue (1983), Dungeon Adventure (1983), The Dragonstar Trilogy (1984), Fantasia Diamond (1984), Hampstead (1984), Message from Andromeda (1984), Kentilla (1984), The Great Detective (1984), The Saga of Erik the Viking (1984), Forest at World’s End (1984), Quest for the Holy Joystick (1984), Return to Eden (1984), Spider-Man (1984), Heroes of Karn (1984), Sherlock (1984), Twin Kingdom Valley (1984), Ground Zero (1984), A Harvesting Moon (1985), Mordon's Quest (1985), Adventureland (1985), The Secret of St Bride's (1985), Four Minutes to Midnight (1985), The NeverEnding Story (1985), Red Moon (1985), Gremlins (1985), Ice Station Zero (1985), Bored of the Rings (1985), Emerald Isle (1985), Terrormolinos (1985), Subsunk (1985), Robin of Sherlock (1985), The Worm in Paradise (1985), The Sorcerer of Claymorgue Castle (1985), Souls of Darkon (1985), The Lord of the Rings (1986), H.R.H. (1986), The Doomsday Papers (1986), The Boggit (1986), Matt Lucas (1986), Dracula (1986), Dodgy Geezers (1986), An Everyday Tale of a Seeker of Gold (1986), Bugsy (1986), Hunchback: The Adventure (1986), The Legend of Apache Gold (1986), The Colour of Magic (1986), Journey to the Centre of Eddie Smith's Head (1986), Play It Again, Sam (1986), The Price of Magik (1986), The Very Big Cave Adventure (1986), The Terrors of Trantoss (1986), Spytrek Adventure (1986), Quest for the Golden Eggcup (1986), Shrewsbury Key (1986), Winter Wonderland (1986), Twice Shy (1986), Scary Mansion (1987), Book of the Dead (1987), Shipwreck (1987), The Big Sleaze (1987), Frankenstein (1987), Knight Orc (1987), The Pawn (1987), Necris Dome (1987), Imagination (1987), Double Agent (1987), Kobyashi Naru (1987), Gnome Ranger (1987), Jack the Ripper (1987), Rigel's Revenge (1987), S*M*A*S*H*E*D (1987), The Base (1988), The Guild of Thieves (1988), Behind Closed Doors (1988), Wolfman (1988), Cloud 99 (1988), Philosopher’s Quest (1988), Venom (1988), Jinxter (1988), Lancelot (1988), Dr Jekyll and Mr Hyde (1988), Mindfighter (1988), The Raven (1988), Corruption (1988), The Hermitage (1989), A Legacy for Alaric (1989), Magnetic Moon (1989), Scapeghost (1989), The Gordello Incident (1989), Agatha's Folly (1989), and Fish! (1989). The eighties were a golden age for British home computing, and the Sinclair ZX Spectrum was arguably the quintessential British microcomputer - for many people, the machine would be their first experience of digital computing technology in the home environment. The text adventure game may have had its origins on the university mainframe computers of the mid-1970s, but it was in the eighties that the genre would really hit its stride with the general public. With well over two thousand interactive fiction titles released for the machine during its lifetime, The Spectrum of Adventure examines the evolution of the genre via an analysis of various releases which proved to be influential to the overall development of the text adventure game. By considering titles which were published by the major software companies as well as those to be released by some of the many independent developers, the overall progression and maturation of interactive fiction is examined, considering the increasing sophistication of this category of game over the years until its dying days as a mainstream commercial genre at the end of the decade. With their imaginative prose and often-bewildering range of puzzles, text adventure titles retain great nostalgic affection for many computer historians and gaming enthusiasts, and this book considers not only the classic era of interactive fiction but also the way in which the approach of the developers of the time would ultimately influence user expectations of interactive narratives in the present day.